One of the biggest trend today in the industry is the rise of mobile bookings. More hotels are starting to take advantage mobile bookings and experiencing a rise in their bookings. Taylor Short, market searcher at Software Advice, who recently did a report on Hotel Booking App User Interface. The report included eZee Reservation’s mobile booking capability and strengths of its User Interface. In our first ever Q&A session, we spoke to Taylor short who shared his views on mobile booking engine and eZee’s mobile booking engine. What are the key factors for a good mobile booking engine? Travelers are tethered to their phones more than ever, and use them for all kinds of purposes on a trip. Offering functions like real-time rates and information about the area in a convenient and streamlined way is the best way to deliver value through a booking engine. On what basis or standards did you narrow down the top 5? When narrowing down the list of best mobile booking interfaces, I put myself in the shoes of a traveler and looked for a system that is eye-pleasing, simple to use and full of useful features—something I would find invaluable while traveling. Should hotel focus more now on mobile marketing? Absolutely. Mobile bookings are increasing as more and more travelers use their phones or tablets to plan vacations and trips. Hotels can draw significant business from these consumers by offering an engine that makes bookings fast and easy. 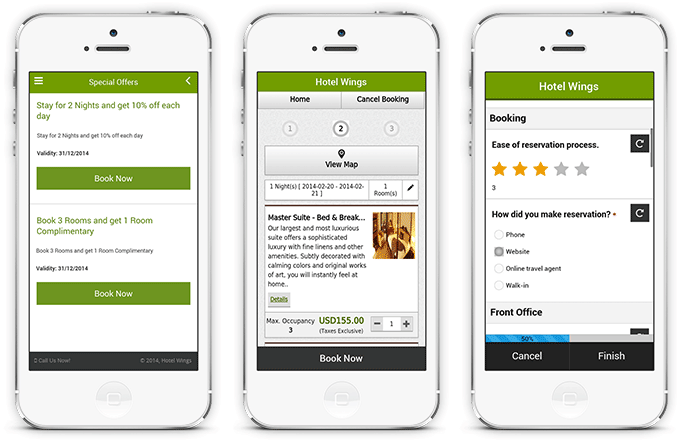 What should hoteliers look for in a mobile booking engine? Hotels should prioritize two main factors when developing or choosing a booking engine: breadth of functionality and ease-of-use. Users should be able to access every function necessary to make their booking, such as maps, local information and a press-to-call feature, all while being simple to navigate. What did you like most about eZee’s mobile booking engine? The first thing I noticed about eZee Reservation’s mobile booking engine is its clean interface and large buttons that clearly show what functions are available, as well as the photos that hotels can use to maintain consistency throughout the booking process. Where do you see the trend going in next couple of years? I think mobile booking will be an increasingly important revenue channel for hospitality in the future, and the ones that standout will be those who offer potential guests the most convenient, feature-rich option. Taylor Short is a Managing Editor at Software Advice, where he does market research on hotel management systems. Before joining Software Advice in Fall of 2013, he worked with various newspapers covering local government and freelanced for Reuters News Agency.